Recently I've been really inspired to do more intricate Project Pan/Empties posts. I have a large makeup collection that only seems to get bigger every month, and there are lots of products I've never finished--an eyeshadow, for example, or a lipstick. A YouTuber I really like, Kitsch Snitch, who is better known for Beauty News, has an interesting goal in her Project Pan: use up $1000 worth of product in one year. I don't want to start doing something similar now, 10/12 of the year in, but I'm thinking for next year it sounds like an interesting goal! I might incorporate that into $1000 worth of empties products, because my Project Pan products are usually harder to finish than all the skincare and haircare that I use. Anyway, let me know what you think of that idea and let's get on to what I finished up last month! I put this in my Project Pan after I finished up a different Bath and Body Works lotion, and I finished this one even quicker! I used it on my legs and feet every day. I do like the scent, but I prefer a traditional vanilla one. Will I repurchase? Probably not, but I wouldn't be mad if I got it as a gift. I bought this for a really good price and burned it several times. It isn't good for filling a large room with scent, but it works perfectly for my bedroom! I find some candles really overpowering in a small space but this one is perfect and refreshing. I haven't seen it in store, but I might repurchase it if I find it again. For now I bought a Candy Cane scented one that smells really similar. This tiny sample gave me literally two applications, so I can't tell you if I enjoyed this mascara or not. Based on my experience with this it was just an okay, average mascara, but it didn't seem like the wand had much product on it so maybe the full-size would be different. I probably wouldn't purchase it. Another Ipsy sample, this one was a much better size and I got at least seven uses out of it! You only need a thin layer and I'm really impressed with how well this mask works. It's a thin, slightly rough white mask that gives a cooling effect as it dries, sort of like how charcoal products feel. When it's dried it is stiff and you can see dark spots around your pores where it drew out impurities. I would definitely like to buy this at some point in the future! I had this in my Project Pan and intended to use it, but this is the oldest primer I own and I think it's time to get rid of it even though I'm not done with it. I think it was an okay product, but I wouldn't repurchase it based on the performance. People say this is a good dupe for the It Cosmetics Superhero mascara, and I have to agree...for a few months at least. This mascara dries out much faster than the It Cosmetics one. It is less than $5 so it doesn't break the bank to repurchase it every two or three months, especially compared to the It Cosmetics one if you have to repurchase that every six months. I would repurchase this at some point, but I have a lot of mascaras on backup so it will be a while! Another Project Pan product (I'm on a roll this month) I started using it every other day and used it up in about two weeks. I prefer the Sensual Amber lotion, I find the scent more subtle, but the perfume is nice, too. I don't think that I would repurchase it. I bought this one over a year ago and it finally started to dry out. I really liked it while I had it, but because Revlon isn't cruelty-free I won't repurchase it. It's not a bad option but for the same price you could get the Nyx Epic Ink liner, which is what I would recommend from the drugstore! The Colorstay liner is a fairly thin felt-tip and the formula was not bad. Another eyeliner that I've had for far too long, it was starting to get dry and tug at my eyes so it's time to toss it. I think that this is the sort of liner that you have to use everyday to keep it in good condition, otherwise the end dries out, and that's not how I use my liners so I'm not a big fan of it. Sadly I've had this for around six months so it is time to get rid of it. It's my last Maybelline Colossal mascara, which used to be my absolute favorite. It's so easy to use and it does an amazing job of separating and elongating my lashes, which is my priority when it comes to mascaras. Maybelline isn't cruelty-free so it is time to say goodbye to this mascara. If you have any drugstore recommendations, I would love to hear them! Those are all the products I finished last month! I think I did pretty well and I'm hoping to finish up even more throughout November. Have you finished up any big products recently? 11 comments on "October Empties "
When I first purchased the Essence Princess mascara I didn't like it, I also did a review on it (negative) but a couple of girls recommended that I may have to leave it for a while to dry and I did and I really enjoyed using it but it dried so fast. I may re-purchase soon. 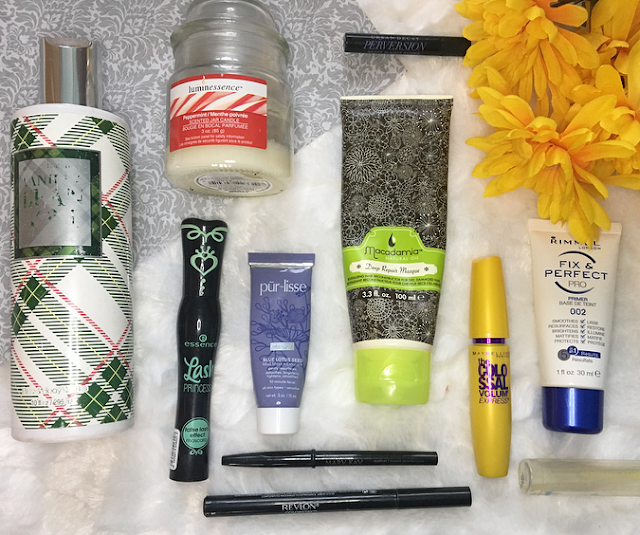 Great list of empties! I'll have to check out that hair mask. I have dry hair and I've been enjoying hair masks lately. I also really enjoyed the Essence Lash Princess mascara. The Macadamia Masque sounds brilliant, I used to have a different hair repair mask from that brand and a split end hair oil and I loved them both! I love the idea of using products with goal, because it then you will use them more. I would love to see a price countdown too! That would be so interesting. But for my empties, I haven't finished anything big lately. I'm using all my samples at the moment! I never have any luck with Essence mascaras and I have tried almost all of them. :-( I do like Perversion, it was pretty good but these days I stick to my holy grails, Marc Jacobs Velvet Noir and Sephora LashCraft Big Volume. Great job at finishing quite a few bits! I like the idea of finishing up X amount worth of products. Definitely something I want to do for 2018 too! Purlisse Mask, because they sound great! I finished the Weleda organic calendula cream bath. Normally this is for the sensitive skin of babies, but it is so comfortable to my skin, that I use it as an adult. I really can recommend this! You can get more details about it on https://myorganicformula.com/articles. I am looking forward to your next empties article.